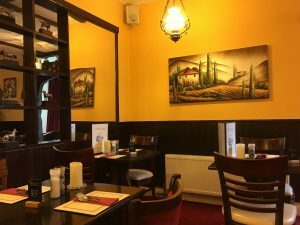 Our informal restaurant has a cosy, pleasant atmosphere and along with the Lounge Bar provides a relaxing dining experience. Our staff are friendly and our flexible approach to dining has always been a part of our unique charm. 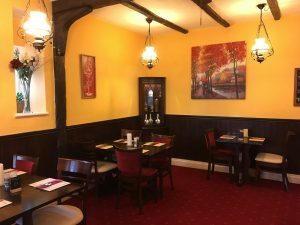 Our Main Menu offers customers a choice of traditional English fare, complemented by the Chef’s Specials and Steaks, all of which are homemade and cooked to order. We also serve freshly ground Lavazza Coffee. Whatever your requirements for a Buffet, we have years of experience ensuring that your event is a success. From a simple finger buffet in the bar, to a sit down cold buffet in our restaurant, we will do our best to accommodate your specific wishes. View our Buffet Menu here or contact the Duty Manager for more details. Golden Bowler Gift Vouchers are available to purchase all the time the pub is open in £10 denominations. They make a lovely gift for any occasion. Please contact us for full details or drop in and ask one of the team.